Sera loves working at Brides by the Sea. Her designs are a huge success and she's made many brides happy with the perfect dress. There's one bride who won't get married in one of her dresses though, Sera's sister Alice. Alice lives in London and has planned her wedding meticulously. It has to be luxurious and absolutely flawless, this also includes a wedding dress by a famous designer. There's even a wedding book for everyone who's involved. When work delays Alice's arrival on her wedding location she asks Sera to make the arrangements for her. Sera and Alice are completely different and Sera isn't sure she can meet her sister's standards, but if there's something she can do for the sister who always used to be there for her when they were younger she will do it. Together with the 'help' of the two best men, Quinn and Johnny Sera tries to do everything Alice is asking of her. However, nothing goes according to plan. Is Sera going to mess things up and will she ruin the wedding of her sister's dreams, will she be able to resist the charms of the flirty Quinn and will she pull it off not to make a fool of herself in front of the sensible and gorgeous Johnny﻿? 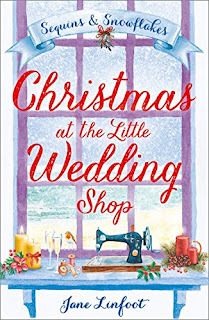 Christmas at the Little Wedding Shop: Sequins and Snowflakes is a wonderful festive Christmas story. Sera is a sweetheart. She makes the most stunning and elegant wedding dresses, but is alternative and casual when it comes to dressing herself. She's fun and a little eccentric. Alice is a groomed businesswoman who always has everything under control. Sera is the exact opposite, she just goes with the flow. I loved how she remained herself in the complete wedding chaos Alice has left her in charge of. Not every helping hand is one Sera can actually use and she never despairs. I laughed out loud several times while reading what she was up against. Nevertheless, when there's a problem she solves it. She's a lot stronger than she thinks and I found that completely endearing. Jane Linfoot has the amazing ability to come up with the most incredible settings and atmospheres, which makes me a big fan of her stories. When I'm reading her books I'm completely oblivious to what's going on around me for several hours. 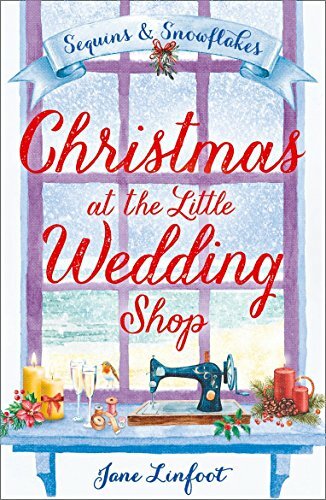 Christmas at the Little Wedding Shop: Sequins and Snowflakes is magical and I was absolutely spellbound by the decorations, the snow, the pretty dresses, the delicious food and drinks and the love and friendship the main characters feel for one another. 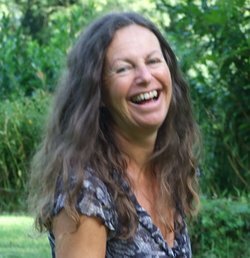 Jane Linfoot has captured the true Christmas spirit and I read her story with a smile on my face. I also had tears in my eyes every now and then, because there are some emotional romantic moments in the story. It's exactly what I like when I'm reading about real Christmas romance. Christmas at the Little Wedding Shop: Sequins and Snowflakes can easily be read as a standalone. I would advise you to read The Little Wedding Shop by the Sea: Cupcakes and Confetti as well though, because it's equally lovely. I enjoyed reading both books in this series very much and highly recommend them. Jane Linfoot's books always bring plenty of joy. I write fun, flirty fiction, with feisty heroines and plenty of heat. Writing romance is cool, because I get to wear pretty shoes instead of wellies. I live in a mountain kingdom in Derbyshire, UK, where my family and pets are kind enough to ignore the domestic chaos. Happily, we’re in walking distance of a supermarket. I love hearts, flowers, happy endings, all things vintage, most things french. When I’m not on facebook, and can’t find an excuse for shopping, I’ll be walking, or gardening. On days when I want to be really scared, I ride a tandem. 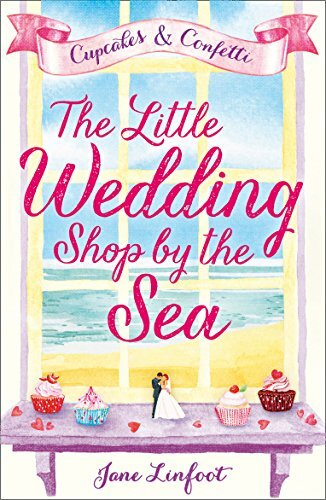 One very lucky reader of With Love for Books will receive a signed copy of The Little Wedding Shop by the Sea: Cupcakes and Confetti. This sounds like a cute, enjoyable read! The review sounds good. Thanks for sharing. Love the cover too. I love the sound of this! I'm a big fan of cute Christmas romances. What book are you reading now?/Are there any new authors that have grasped your interest? Both books sound lovely. The Wedding book you reviewed sounds like it would make a great rom com film aswell as a book. Sounds so adorable. I would love to read it. Thank you for posting. Cupcakes and Confetti by Jane Linfoot. I'm sure I'd enjoy reading this since I've read a lot of 'heavy' books now and I need something to lift my reading spirits! Your author picture is so cute and happy. You made me smile! I liked the review. Sounds like a great read!